By adopting quality LED drivers and SMD chips, it will not disappoint our clients. 1. 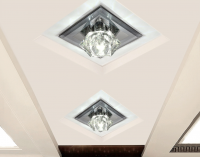 The clip ceiling flush mount fixtures contemporary look popular in commercial and residential settings. 3. ENERGY STAR-qualified LED lamping. 4. Using advanced Down Lamp Light dissipation technology and modular design.